The new SUV from Toyota – next generation Toyota Fortuner has been spotted in one of the Indian roads and the design of the car resembles the Hilux. If you did not know before, the new Toyota Fortuner, Innova as well as the Hilux are based on the same platform, however all the 3 cars would look entirely different in the next-generation version. Toyota Fortuner gets the all new sleek headlamp design which is sharp and a very stylish front-end too. The new Toyota Fortuner comes has a front grille which is pretty slimmer and comes with chrome bling on top of it. The fog lamps of Toyota Fortuner are narrow and small, however the car gets the thick chrome surrounds. The next-generation Toyota Fortuner would be sleeker and sharper looking when compared to current Fortuner which is in the market. The new design of Toyota Fortuner competes with the Hyundai Santa Fe and faces a very stiff competition. The all new Toyota Fortuner would be much lighter than the current generation SUV (Sports Utility Vehicle) and also comes with a down-sized engine whose capacity is 2.2-litres. Toyota Fortuner would be derived from the currently selling 3.0 litre engine which comes with a better performance and improved fuel efficiency. The new Toyota Fortuner would be offered in 2 variants – 4×2 and 4×4 options and it is expected to launch in Diesel variant. Do not expect petrol powered Toyota Fortuner as it is going to be launched in Gulf countries first. 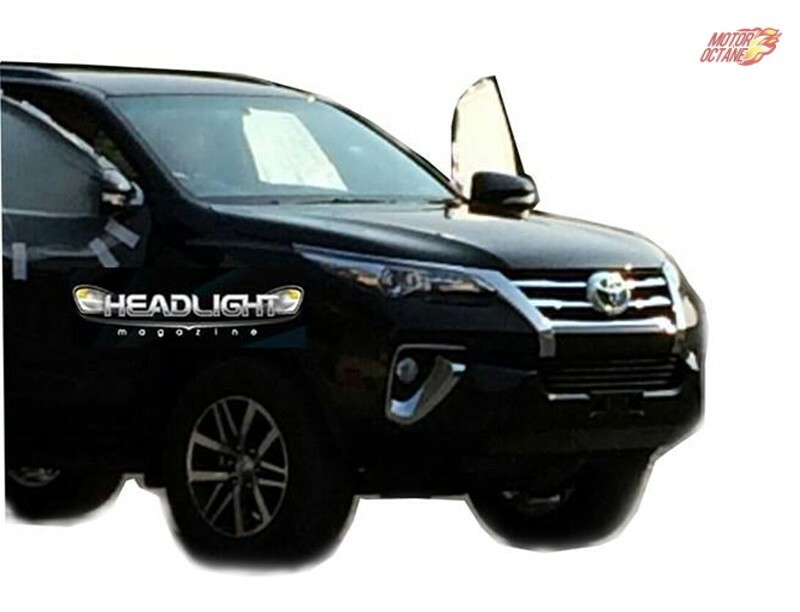 Automobile portal named HeadlightMag first spotted the new Fortuner on road which was then reported by MotorOctane. The all new Toyota Fortuner would possess a very similar dimensions to that of the currently sold Fortuner version, however it would come with a better driving dynamics and the off-roading capabilities of the car would be enhanced. The anticipated next generation Toyota Innova too would be lighter as well as the engine on the MPV(Multi-Purpose Vehicle) is going to be downsized. The Japanese automaker is also looking at increasing the fuel efficiency of Toyota Fortuner, the Hilux and the Innova. In the other note, the Hilux from Toyota would not be making it to India.